This season, make a batch of these Holiday Scotcheroos for a fun and festive dessert! Chewy peanut butter and chocolate treats! I’m not usually very good at making my food FUN. I mean, I can whip up some incredible tasting treats…but to go the extra distance to make it cute and fun? Not usually my style. However, Christmas time has me under a spell, and I tend to LOVE making cute sweet treats! Like today’s recipe for Holiday Scotcheroos. Sure, you can just press these in a pan, cut, and enjoy. 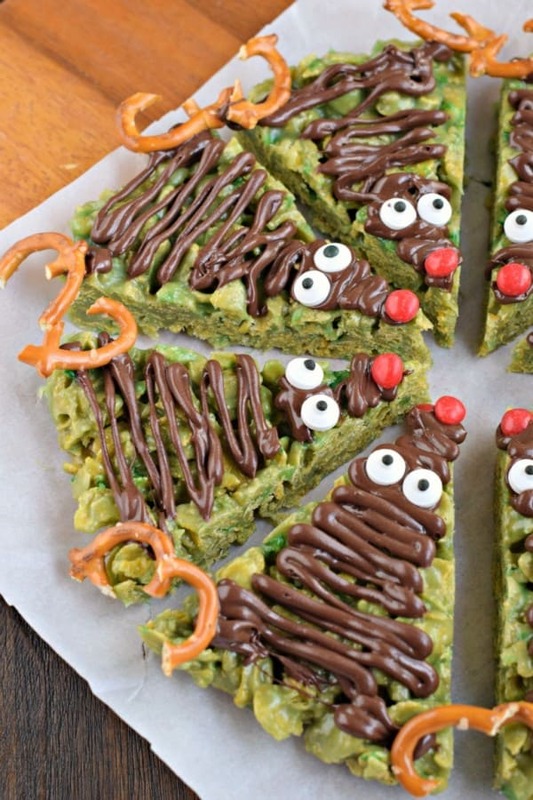 And I fully expect to do this when it’s NOT the holiday season (because these taste amazing). OR, you can make something fun, with very little extra work. 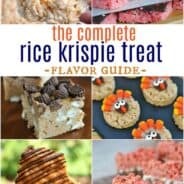 It’s no secret I love rice krispie treats here on my blog. 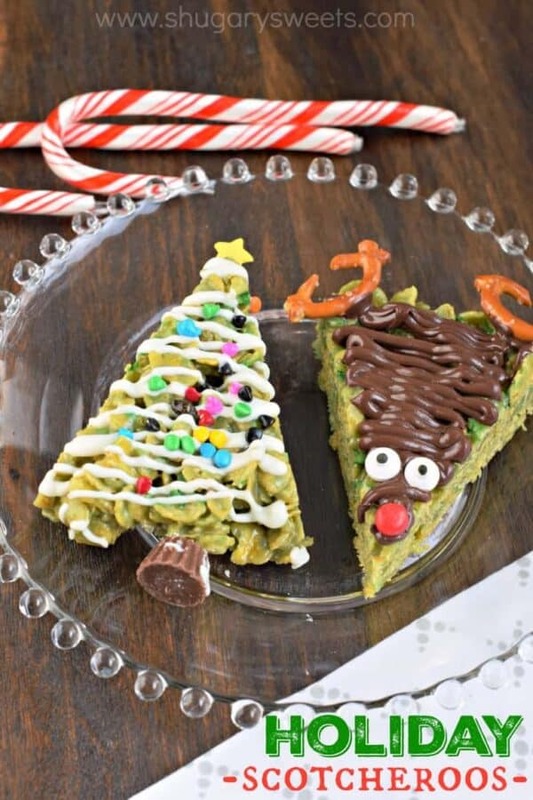 So when I saw this recipe for Christmas Tree Scotcheroos, I was excited to say the least! A traditional Scotcheroo recipe is made with peanut butter, butterscotch, chocolate, and rice krispies cereal. They are chewy and delicious! Unfortunately I opened my pantry and realized my love for rice krispie treats has used up all my crispy rice cereal. HOWEVER, I didn’t let that stop me! Oh no. I grabbed a box of corn flake cereal to use as a substitute. I was positive it would work as my aunt has always made delicious, chewy wreaths for the holidays using corn flake cereal. And how, you may ask, do they get so chewy? The light corn syrup adds a chewy texture while giving the perfect amount of sweetness needed for the peanut butter and white chocolate to stand out in these Scotcheroos! Each batch of Holiday Scotcheroos makes two 9-inch round baking pans that get cut into 8 triangles (for a total of 16 wedges of scotcheroos). After cutting my first pan to make the Christmas Tree version, I wanted to try something fun (yes, ME, fun!). I took the second pan of scotcheroos, cut them into wedges, only this time made some adorable reindeer! 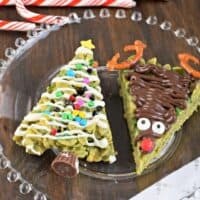 These would be such a fun treat to make with children for the holidays, or bring to a Christmas party! Baking is a great way to show much you care for someone, so bake a little extra this holiday! 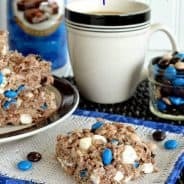 Knowing how to make Scotcheroos is not that different from knowing how to make rice krispie treats. First, line your 8 or 9-inch round baking pans with parchment paper. This will make the treats easy to lift out of the pan after they have set. In a large saucepan, you’ll combine corn syrup with sugar over medium heat until the sugar dissolves. Bring mixture to a boil and boil for ONE full minute. Remove from heat. Stir in peanut butter and food coloring until smooth. Make sure you add your green food coloring to the peanut butter mixture BEFORE adding your cereal, for a smooth color. If you want to omit the green food coloring all together, that’s an option too (or only color half the mixture for the trees! The Reindeer might even be cuter that way. But, for ease of work and keeping this as a simple family baking project, I opted to color BOTH pans of treats green! 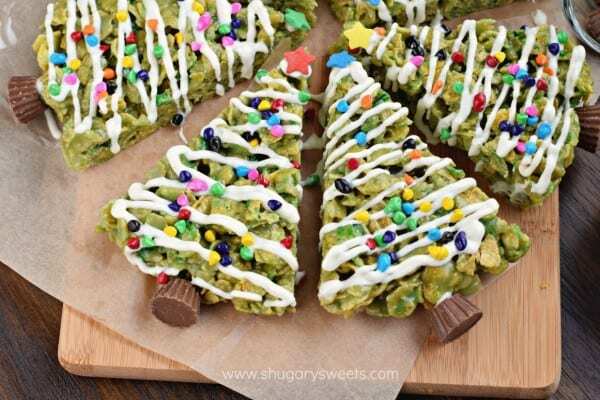 For the Christmas tree, gather all your toppings before beginning to decorate. The melted white chocolate hardens fairly fast. I put it in a small sandwich sized plastic bag and snip off the corner. Then drizzle over the cut trees. 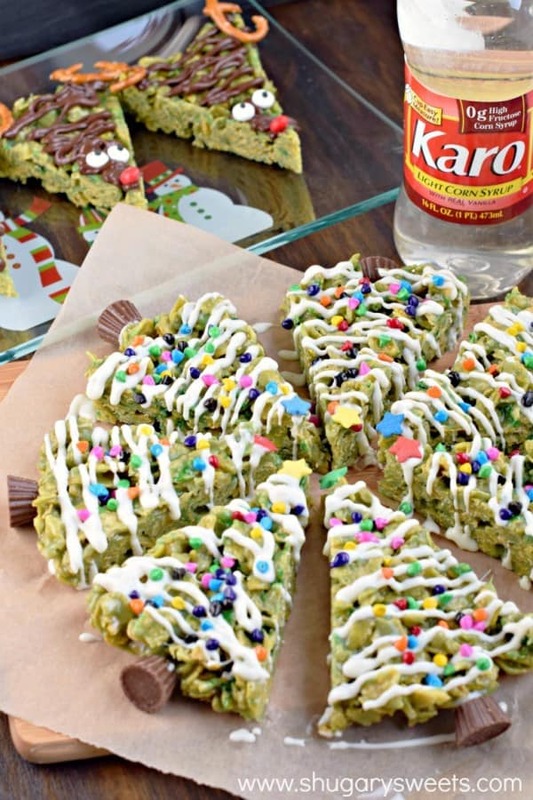 Add your rainbow chips or sprinkles immediately. If you can’t find star shaped sprinkles, you can use a candy coated chocolate or a cinnamon red hot. For the finishing touch on the Christmas tree, add a dollop of melted white chocolate to the top of a mini peanut butter cup and press firmly to the bottom of the tree (to create the stump). 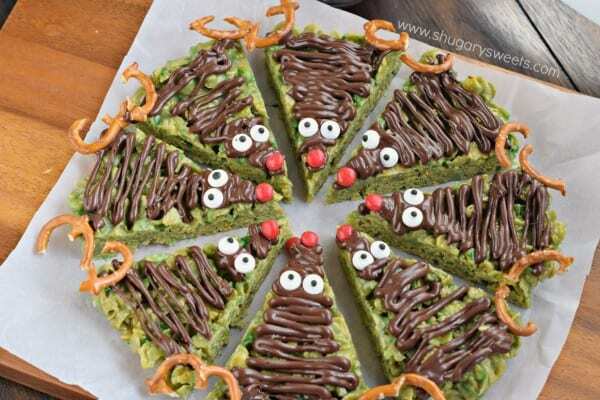 For the Reindeer, once you’ve cut your triangles, melt your chocolate. You can either spread the chocolate onto the tops with a knife, or add the chocolate to a small sandwich bag with the corner snipped off (which is what I did) and drizzle the chocolate on to completely cover the top of the scotcheroos. Break your small twist pretzels and add them for antlers. Add a cinnamon nose and candy eyes to complete the look. Store your holiday scotcheroos in an airtight container to maintain freshness! Line two 8 or 9-inch round baking pans with parchment paper. Set aside. In a large saucepan, combine corn syrup with sugar. Heat over medium heat, stirring constantly until sugar dissolves. Bring mixture to a boil. Boil for 1 minute then remove from heat. Stir in peanut butter and food coloring until smooth. Add cereal and fold gently until evenly coated. Pour mixture into prepared baking pans. Pat gently with back of wooden spoon. Allow cool and set about 30 minutes. Remove from pans by lifting the parchment paper. Place on cutting board and cut each circle into 8 triangles. Separate slightly so there is a space between each triangle. For the Christmas trees, add melted white chocolate to a sandwich sized plastic bag. Snip off the corner and drizzle over one pan of scotcheroos. 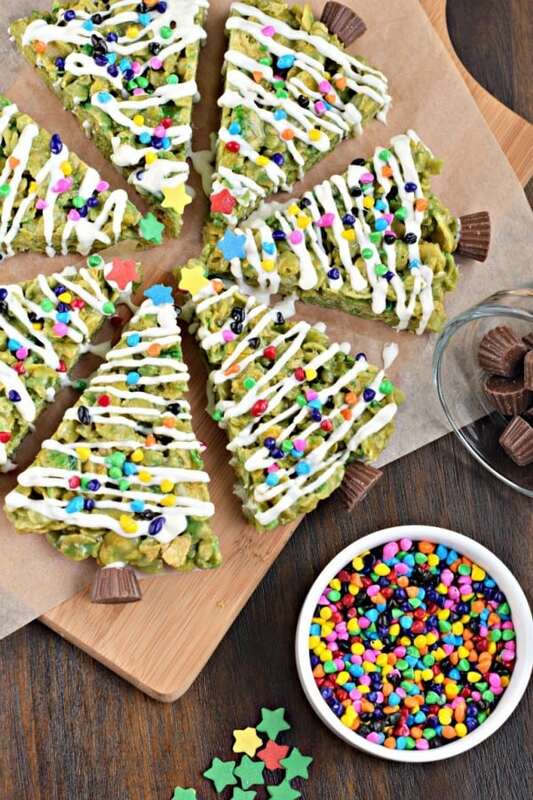 Add rainbow chips and star to trees. Using the melted white chocolate, add a drop to the top of a peanut butter cup and press into the bottom of the tree for the trunk. For the Reindeer, add melted chocolate to a sandwich sized plastic bag. Snip off the corner and drizzle generously over the second pan of scotcheroos, coating the top completely. Break each pretzel and add as antlers. Add the cinnamon red hot for the nose and candy eyes! Allow chocolate to set, about 10 minutes. Store in airtight container for several days to maintain freshness. Okay, you totally won the cute contest today! I mean, I’ll go reindeer every time. Then you get to use candy eyes, and those are the best! And corn flakes are awesome. It’s so good that you ran out of krispies so that you could get addicted to a different cereal treat! Well, these are the cutest things I’ve ever seen. You win at Christmas. Does that come with a Christmas Crown? Confession: I’ve NEVER had a Scotcheroo. I KNOW, I am missing out on all things delicious! Oh, and CUTE. Because these are the cutest things ever. I agree with karly, you win at Christmas! Pinned! What a creative idea! So fun and festive! I love these SO MUCH! So creative! You know how I feel about cute treats made with googley eyes!!! I puffy heart love these!!! The trees are super cute too, but those reindeer have my heart!!! You did good, girl!!! These are the cutest ever! I love the Christmas trees especially… I can’t resist all those festive sprinkles! I am totally under the spell of Christmas too!!! BTW, these are AWESOME. 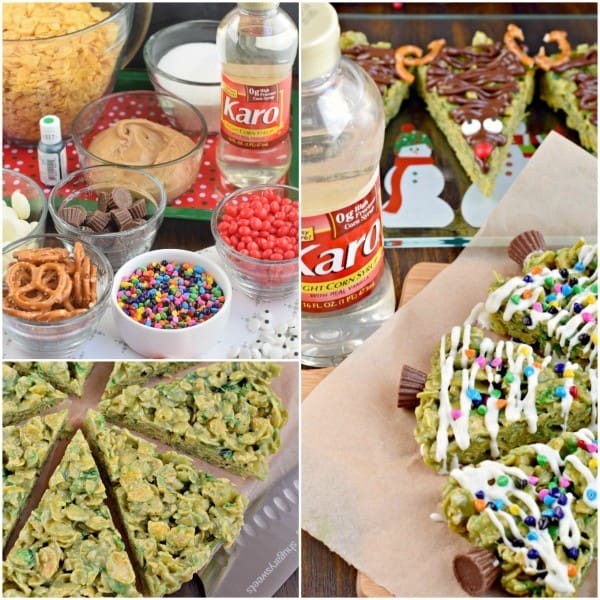 I am going to need to buy stock in Caro for the amount of treats I plan on making this year! Great recipe! Awe these are so cute I wouldn’t be able to eat them they are too cute! I’m not very crafty when it comes to making treats, but these trees and reindeer are just my speed! Plus it gives me an excuse to make scotcheroos!! !